​A contemporary take on the universality of the family tree and the number 3. Our families. Those that are connected to us by blood as well as those who become part of our lives and influence it greatly. Those that we care for and nurture. Those who do the same for us. And those who we’ve never known but exist now or after us. I’ve worked 3 sites in this forest to explore ’family’ both on a personal level and within a more general context of what ‘family’ is. Have you ever told or listened to family stories where everyone remembers the same event slightly different? To mark each of the three sites in the forest, I erected panels (triptychs) to suggest a viewing point. While each triptych ‘looks’ at the same subject, viewing through the three openings offer a slightly different perspective. I’ve used the triptych to represent my two siblings and I. You will notice in each, one board is taller than the other two and this prominence shows the site is dedicated to that individual. I am the middle board, my brother is to my left and my sister to the right. I have chosen to use a variation of the three primary colors to further designate one of the three sites. From red, yellow and blue, all color can be created and so is used as another expression of foundation, base and origin. For the same reason I implemented three elementary shapes – the square, the circle and the triangle. The square offers us to consider opposing forces with two sets of parallel lines. The circle depicts the continuous cycle of life and the triangle presents stability and strength. 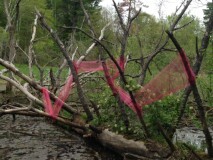 Opening the installation is the dead fallen tree in the pond. The seven branches marked with the continuous swath of red fabric has a dual purpose. The first making the connection to 3 generations in our family and therefore 7 individuals and the other in an acknowledgment of the Bishop family who for 7 generations have owned and managed this land. These 7 individuals are further represented by small pieces of branches hung from each of the wrapped branches that, if caught by the wind, will sway to counter the static branch from which it is hung. ​While obvious what nature has presented here, we can consider this life cycle within our own personal lives. I chose to hang 3 tapestries to symbolize the weaving of family events and stories. I invite you to also add to these tapestries your own story or event by using what has naturally fallen on the forest floor. I am interested in the potential of fullness in these tapestries and hope by October (end of installation) they are laden with ‘life’. ​With the previous two sites oriented around the impermanence of people and events, this site was chosen to remind us of the ‘here and now’, the present. A more complete representation of my two siblings will lead you down the bank to a ‘sitting stone’. I’m off to the right at the base of a trio of trees, the 3 of us. The mirror placed at the base of this trio becomes self evident once seated.